Navigating the history of the ancient Egypt and exploring the ambiguity of the pharaohs, are realized in your Abu Simbel Tour as you visit the monuments’ spots in Cairo, Luxor and Aswan. After breakfast you will be accompanied by your personal guide to Giza Plateau to visit one of the seven wonders of the ancient world, the Great Pyramids of Cheops, Chefren and Mykerinus, famous Sphinx , varying between six-thousand and even thirteen-thousand years old ,and Valley temple facing the great statue. Then transfer to enjoy the Egyptian Museum, Treasures room for the child king Tutankhamen. Continue to Coptic Cairo to visit the Hanging Church and Ben Ezra Synagogue. Combining fascinating history with shopping in a lively Khan El Khalili Bazaar, this dates back to 1382. Later, you will be transferred to Giza railway station to board the sleeper train to Luxor-dinner and breakfast will be served on board. Overnight inside your compartment. Arrive at Luxor train station where you will be met & assisted then transferred to enjoy an excursion to two of the most interesting tombs at the West Bank of the Nile River, the Valley of the Kings, the Temple of Hatshepsut, the powerful Egyptian queen, and the Colossi of Memnon. 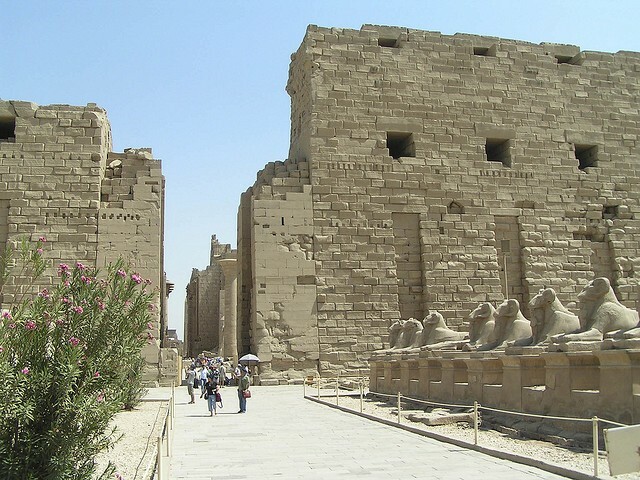 Then visit the splendid Luxor Temple, considered the greatest open-air museum and probably the second most visited historical site in Egypt, Karnak Temples. Back to hotel and overnight in Luxor. After breakfast transfer by air-conditioned vehicle to Aswan about a 3 hours and half drive from Luxor to Aswan. Upon arrival, you will be met and taken to your hotel for check-in. See the world famous High Dam and the Unfinished Obelisk, then on to the beautiful located Temple of Philae on Isis Island and the Granite Quarries, which is dedicated to the goddesses Isis and Hathor. Sail and move around Elephantine Island by a felucca boat. Back to hotel and overnight in Aswan. Breakfast box, at 03:30 am start your trip to Abu Simbel Temples. It takes about a 3 hour and half drive one way from Aswan to Abu Simbel by a private air-conditioned vehicle. Upon arrival at Abu Simbel, enjoy the impressive Temples of Ramses II at Abu Simbel, which is dedicated to the four universal gods Ptah, Re-Harakhte, Amun-Re, and to Ramesses II. Then return to Aswan. After that transfer to Aswan railway station for departure to Cairo. Sleeping train from Aswan to Cairo is about 14 hours. Overnight on board the train. Breakfast aboard sleeper train before arriving Giza train station, where you will be met and assisted by Egypt Travel representative who will transfer you to your hotel for free time at leisure( you will check into your room as early as possible ) with some optional excursions available in Cairo to visit Step Pyramids of King Zoser in Sakkara and Memphis.Overnight stay at your hotel in Cairo. Free day in Cairo or optional trip to Alexandria, to visit its famous sights, where you can see Qaitbay Fort, built in the 15th century by Sultan Qaitbay on the spot of Alexandria's ancient lighthouse. Stop and move around the grand Montazah Palace, which combines Turkish and Florentine architectural styles, then move on to the new and much-acclaimed Alexandria Library. Also visit the Roman cemetery cut out of the rock, the Catacombs. Overnight in Cairo. Breakfast, transfer to Cairo International Airport for final departure. Sightseeing tour to Abu Simbel by a private air-conditioned vehicle.